Live broadcast mobile TV is the key feature of Nokia's latest N77 smartphone that's shipping from today. 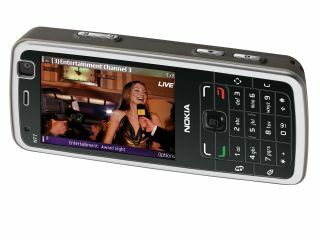 The N77 is Nokia's first regular candybar-shaped mobile featuring DVB-H (Digital Video Broadcasting - Handheld) TV technology. It has a large display geared up for optimum TV viewing. The 3G-enabled Nokia N77 also has dedicated TV viewing controls, and a novel 30-second replay facility. This can be used while watching live TV programmes. Up to 50 TV and radio stations can be stored on the N77's DVB-H tuner. An electronic programme guide provides 7-day viewing information, and N77 users can set alerts for shows they don't want to miss. Up to 5 hours' battery life is claimed for live TV viewing. The Nokia N77 is on sale now in Finland, where DVB-H mobile TV broadcast services are up and working. Nokia is also starting to ship the N77 in countries where DVB-H broadcast networks are currently operational. Vietnamese and Indian mobile users will be among the first tuning into TV on N77s later this month. No DVB-H TV service is likely in the UK for the next couple of years at least, owing to regulatory and spectrum issues. So an official Nokia release in the UK is unlikely. The N77 uses the familiar Nokia Symbian S60 smartphone platform. It has a 2.4-inch QVGA (320 x 240) 16-million colour display, which is used sideways for TV viewing. It has a 2-megapixel camera and a secondary front facing camera for video calling. A multimedia player offers digital music and video playback too. Stereo Bluetooth and USB connectivity are also included.